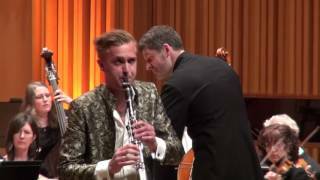 Emil Jonason (b.1983), a long time connoisseur of the stranger side of music, has been described in the international press as ‘lifting the bar for what to expect from the clarinet’, ‘having the aura of a Rock Star’ and being ‘a magician who uses his instrument as a silver bullet exceeding classical norms’. He has appeared as a soloist with the Swedish Radio Symphony Orchestra, Düsseldorfer Symphoniker, Royal Stockholm Philharmonic Orchestra, Gothenburg Symphony Orchestra, Weimar Staatskapelle, Symfoniorkest Vlaanderen, Norrköping Symphony Orchestra, Cabrillo Festival Orchestra and many more. 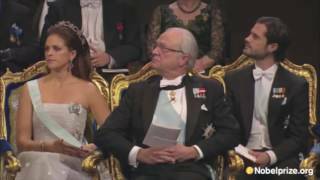 Jonason was nominated Rising Star by the European Concert Hall Organization in 2009, and was invited to Vienna Musikverein, Amsterdam Concertgebouw, Hamburg Laieszhalle, Barcelona L’Auditori, Cité de la Musique in Paris and several other prestigious scenes throughout Europe. In 2012 he became known to the world when he performed again as a soloist at the Nobel Prize Ceremony with the RSPO, and in 2013 he made his US debut when invited by Marin Alsop to play at the legendary Cabrillo Festival of Contemporary Music. Later the same year he premiered Christian Lindberg’s clarinet concerto ‘The Erratic Dreams of Mr Grönstedt’ with the Gothenburg Symphony Orchestra, and a new era of clarinet music was born. 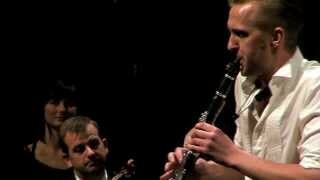 In 2016 BIS Records released their first solo album with Emil Jonason, on which he performs “The Erratic Dreams of Mr Grönstedt” and Osvaldo Golijov’s “The Dreams and Prayers of Isaac the Blind”. Together with Norrköping Symphony Orchestra with conductor Christian Lindberg, and the Vamlingbo String Quartet.In 2018/19 Emil is touring throughout Sweden with a brand new clarinet concerto: At The Hills of Hampstead Heath, written by Swedish composer Emmy Lindström and commisioned by no more than four Swedish orchestras. The first performance of the concerto has been recorded and broadcasted in Swedish Radio. Emil Jonason grew up listening to Goodman, Armstrong, Davern and Spike Jones and his City Slickers. At the age of ten, he was soon playing everything from wind bands to jazz, klezmer and more, and truly discovered the classical world at the age of 16 (at a time when he was touring with several Klezmer bands to Krakow, Prague and festivals in Sweden) and he was accepted to the Royal College Of Music when he was 17. Emilson has studied for Hermann Stéfansson, Martin Fröst, Yehuda Gilad and Kjell-Inge Stevensson. Only shortly after, Jonason’s musical world exploded. He won the Solofoni Prize, played the Nielsen Concerto with Helsingborg Symphony Orchestra at the age of 21, and performed John Corigliano’s tremendous clarinet concerto with the Royal Stockholm Philharmonic Orchestra at his Diploma Concert in 2007. Emil currently enjoys a diverse career as a touring soloist, teaching at The Royal College of Music and The College of Music in Västerås, and enjoying life with his children and wife, composer / violinist / nurse Emmy, at his home outside Stockholm. 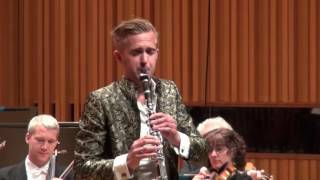 Emil Jonason performs excerpts from Rossini's Introduction, Theme and Variations for clarinet and orchestra together with the Stockholm Royal Symphony Orchestra and conductor Daniel Blendulf. 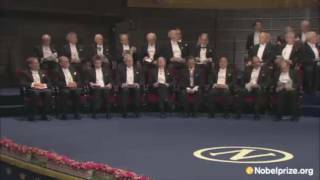 Emil Jonason plays his own arrangement of Tom Waits' song, together with the Västerås Sinfonietta. 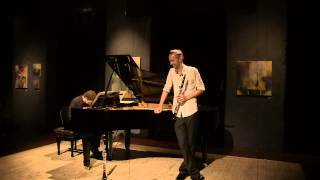 Emil Jonason and Peter Friis Johansson perform their version of V. Monti's Czárdás at the release concert for their CD "Beautiful Insanities" in october 2012.